Mick (he prefers the spelling Mik) Whitnall is the lead guitarist and song-writing partner for Babyshambles, who have rock junkie troubadour Pete Doherty as lead singer. He replaced Patrick Walden in 2007. Before hitting the big time, he spent several years in the rag trade as a clothing salesman at London's Camden market, Carnaby St and Brick Lane, working alongside the likes of style guru Stefan Zoppi for Rick Mendoza Gordon. Like Doherty, Whitnall is thought to have been a frequent drug user but seems to have largely outgrown the habit. 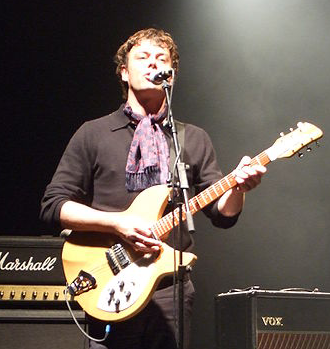 Before Babyshambles, Whitnall played with Kill City fronted by Peter Doherty's ex-girlfriend Lisa Moorish, and also in bands including Finley Quaye's band, ska band 100 Men and 1980's oi/punk outfit Skin Deep. He was born on the 7th November 1968 in Doncaster and as a boy his Dad took him to live in South Africa. Mik signed a publishing deal with Stage Three Music Limited on the basis of his major contribution to the Babyshambles second and acclaimed album Shotter's Nation. Mik has also been rumored to have had an on and off affair with jazzy pop strumpet Amy Winehouse. Thanks to Sean Caddy for the suggestion.